Cement is counted among the key building materials both in the residential and nonresidential sector. It was estimated that the global market was sized at around 395 billion U.S. dollars in 2016. Dublin-based cement producer CRH plc (Cement Roadstone Holdings) topped the list of leading cement manufacturers worldwide, reporting 2016 revenue of around 27 billion euros. 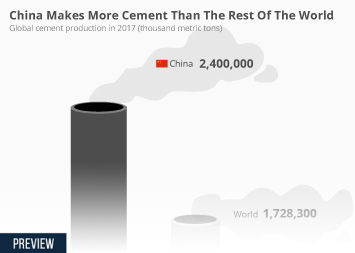 Cement is mostly used for the production of concrete: in the United States, some 71 percent of cement sales went to producers of ready-mixed concrete and around 12 percent of sales went to concrete product manufacturers. In 2016, the U.S. production volume of cement came to around 86 million metric tons. That year, about 85.4 million metric tons of Portland and masonry cement was produced here. Apparent cement consumption in the U.S.